SCOPE: What is an Age-Friendly Community? [clearboth]At the recent Universal Design Coalition Forum held at the headquarters of the Realtor Association of Sarasota and Manatee, I was reminded of how much our built environment influences our personal livability, comfort and enjoyment. By incorporating simple “Universal Design” principles in creative ways, our home environments can be transformed into safe places to live out our lives, surrounded by the people, memories and hobbies that are important to us. While some of the elements are just common sense approaches to easy living – such as having a raised-bed garden that can be tended from a comfortable position – it is the intentionality of exploring little changes with potential for big impact that makes Universal Design one of the leading topics in aging today. 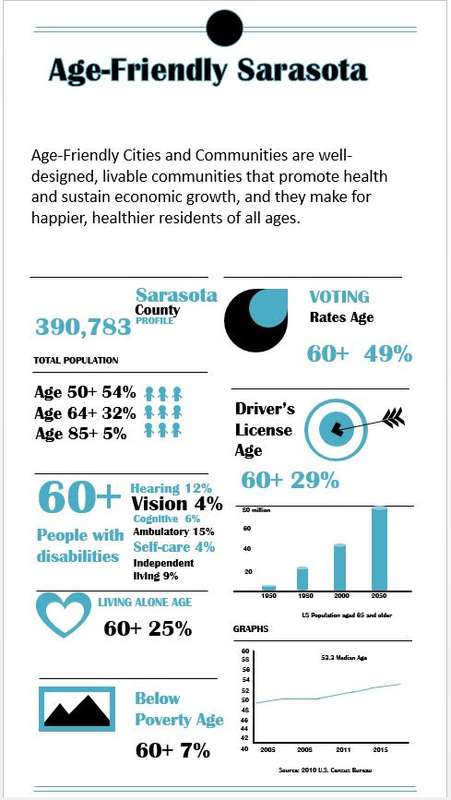 Just imagine what life in Sarasota could be like if we applied this same intentionality on a macro level to our entire community! 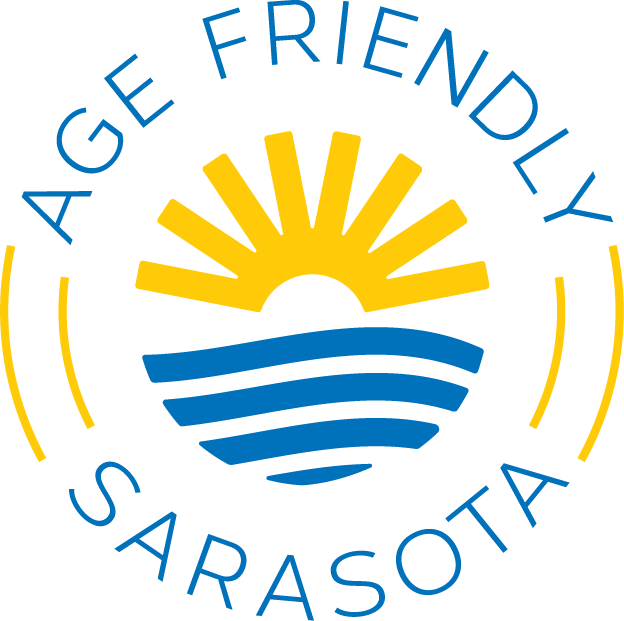 Thanks to The Patterson Foundation’s Age Friendly Sarasota initiative – that’s exactly the opportunity that is within our reach. This new initiative seeks to identify ways to make those little adjustments that make a big difference in our lives. 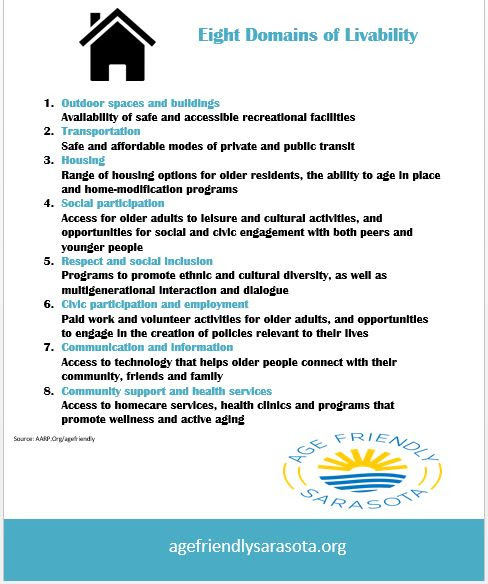 Universal Design Coalition and Age Friendly Sarasota – two ways that Sarasota is intentionally planning for a brighter future for all of us. 1. The movement to create an “age-friendly world” was created by the World Health Organization to meet the challenge of urbanization and population aging. 2. The initiative drives us to rethink what aging means. 3. The Age-Friendly guide and checklist was created using a bottom-up participatory approach. 5. Obtaining and maintaining the “age-friendly” designation by the WHO is a cyclical multi-step process. This research (driven by the survey results) will create the road map for next steps in this initiative. Please do your part and take the survey here. It will be 20 minutes of your time well spent! Please Take our July Survey! Aging in Paradise Resource Center provides quality solutions and exciting opportunities for local seniors, enabling them to live with dignity and the highest possible level of health, independence and quality of life. We are a resource center open to all local seniors providing opportunities to be engaged with others and to continually learn new and exciting information in a warm and welcoming environment. Our focus is on education, engagement, care-giving, health and wellness, socialization, memory, mobility and counseling and support for those going through difficult transitions. AIPRC is located on Longboat Key, but our service area includes seniors throughout Sarasota and Manatee Counties. Boomers and Beyond seeks to advance within our community the development of strategies, products and services for people age 50+. We connect companies and start-up who want rich insights about the older generations with interested individuals and our area’s vast network of experts who serve the aging population. Thrive is our monthly enewsletter that explores what older adults want and need and what is happening in such areas as: health and wellness, technology and aging, retooling vs. retirement, financial planning and living in community. The Universal Design Coalition (UDC) advocates Universal Design concepts and use in the SunCoast area and beyond. At present, our primary focus has been to develop presentations, which are part of communication and education programs centered on identifying Universal Design initiatives that help to implement new Living Environment practices. The coalitionmeets on a monthly basis at the Center for Arts and Humanity in Sarasota. They welcome new attendees to join them in learning more about Universal Design. Please feel free to contact them, should you wish to participate in one of their sessions. “Work Matters!” seeks to create awareness of and interest in the underutilized talents and experience of people age 60+ in this community and identify and encourage opportunities for volunteer, term, part-time and full-time work. iTNSarasota (Independent Transportation Network) is looking for additional volunteer drivers to accommodate the increasing number of requests for iTN services in Sarasota and the surrounding areas. Volunteers help older people and people with disabilities stay connected to families, friends, and activities that bring meaning to their lives – and to yours. To find out more about this valuable service and what is involved in being a volunteer driver, go to www.itnsarasota.org or call Arthur Lerman, Executive Director of iTNSarasota at 941-364-7530. Thank you for supporting SCOPE’s core mission: City of North Port, City of Sarasota, City of Venice, The Community Foundation of Sarasota County, Roskamp Foundation, Sarasota County Government. Read more about SCOPE on our website at www.scopexcel.org. Our phone number is 941.365.8751.